00:13:00 Makes 2 servings, 1 fillet (145 g) each. Makes 2 servings, 1 fillet (145 g) each. 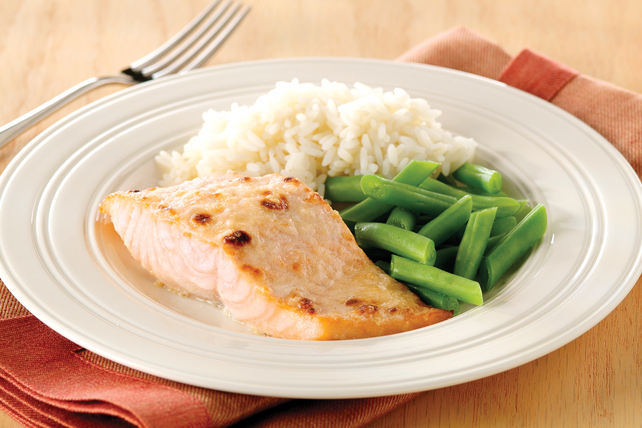 This easy two-step salmon is absolutely delicious! Broil fish, 6 inches from heat, 4 min. Meanwhile, mix Miracle Whip and lemon juice. Spread fish with Miracle Whip mixture; top with cheese. Broil 2 to 4 min. or until topping is golden brown and fish flakes easily with fork. Serving Size Makes 2 servings, 1 fillet (145 g) each.